Looking for things to do in Kona? This is a great little town, fun for the entire family. With sunshine nearly every day, take your time as you explore and soak it all in. One of our favorite things to do in Kona is to wander through the vast selection of vendors at the Kona Farmers and Crafts Market, centrally located on Ali'i Drive (Kona's oceanfront main street). At the intersection with Hualalai Road and adjacent to the Kona public library, this open air market has something for everyone. 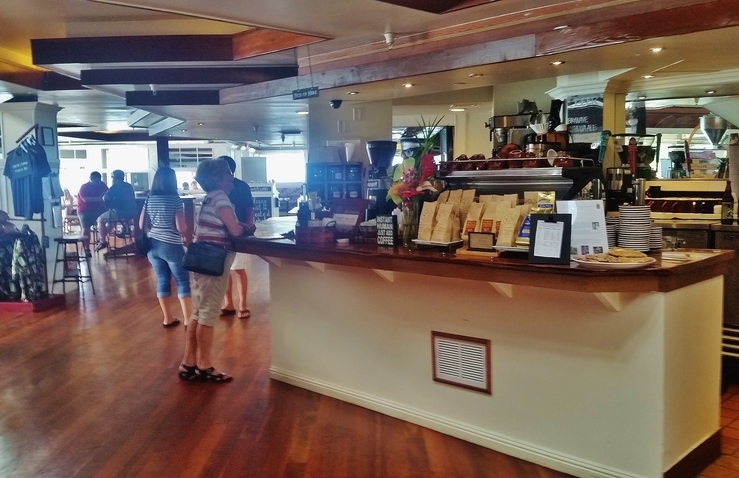 If you're cooking at home, you'll be pleased with the wide selection of fresh island fruits, vegetables, flowers and 100% Kona coffee available here. In addition, the Kona farmers and crafts market is a great place to find gifts to share and souvenirs to take home, as many local artisans have their amazing creations on display. . At least one visit to the Kona farmers market should be on everyone's list of things to do in Kona. Open Wednesday through Sunday from 7am to 4pm. The town commonly referred to as Kona is more accurately Kailua Village. To avoid confusion with the town of Kailua on the island of Oahu, the local post office was designated Kailua-Kona. 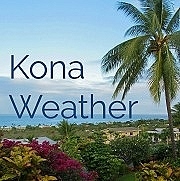 While most people refer to Kailua Village as Kailua-Kona, or simply Kona, Kona actually refers to the much larger coastal district that dominates the west coast of the Big Island. 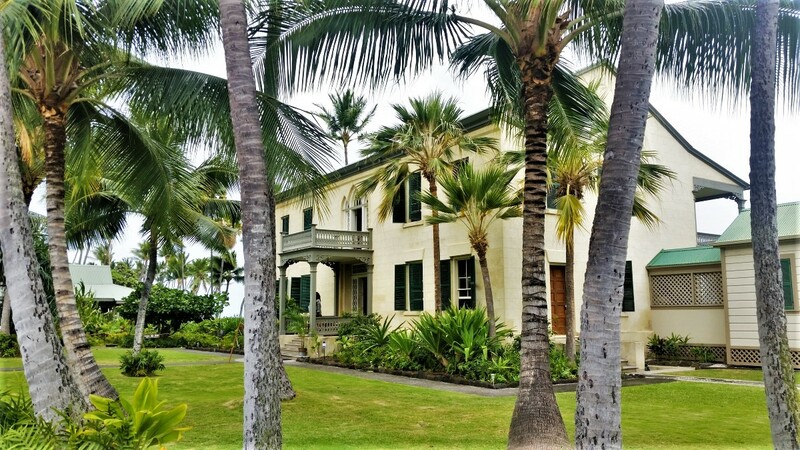 Built in 1838, Hulihe'e Palace once served as a vacation home for Hawaiian royalty. Today it is a museum that showcases part of a rich Hawaii history, beautifully restored and decorated with splendid furnishings and upholstery of the time. Located on Ali'i Drive right in the middle of downtown Kailua-Kona, it's a 4-5 minute walk from the Kona pier and King Kamehameha Kona Beach hotel. 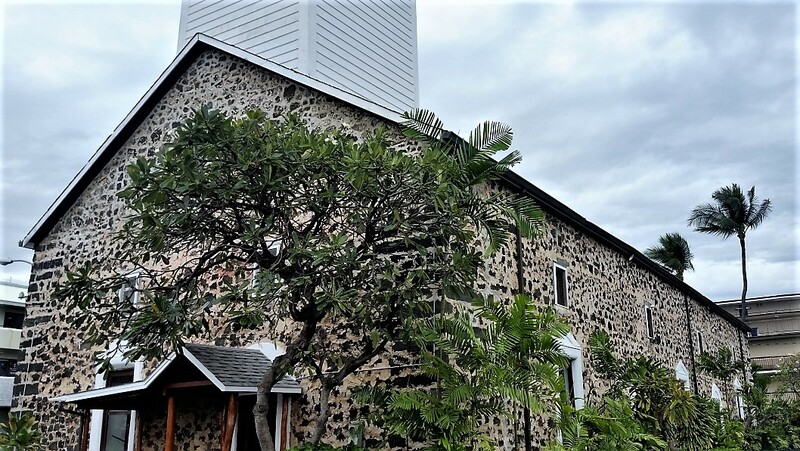 Across from Hulih'e Palace on Ali'i Drive in downtown Kailua-Kona, Mokuaikaua is a beautiful historical structure, built of stones from an ancient Hawaiian heiau (temple) with an interior attractively decorated in Koa wood. A living remnant of 19th century American missionaries, Mokuaikaua is the oldest Christian church in the state of Hawaii. It has been named the 11th most endangered historic site in the United States by the National Trust for Historic Preservation. On the north edge of Kailua Bay, Kamakahonu was once the residence of the great King Kamehameha I. 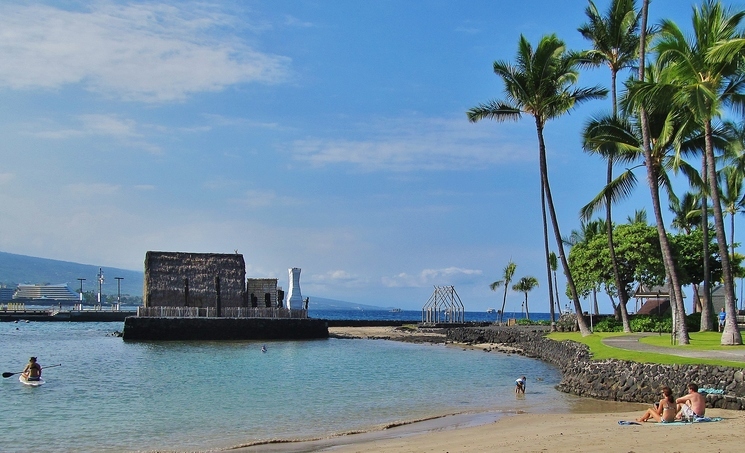 Swim or stand up paddleboard past the ancient temple that still sits on the edge of the quiet bay adjacent to Kamakahonu Beach, fronting the King Kamehameha Kona Beach Hotel. Kaloko-Honokohau National Historical Park is just north of Kailua-Kona near the Honokohau Boat Harbor. Along a section of the Ala Kahakai National Historic Trail, highlights of the park include Ai'opio Fishtrap, Honokohau Beach and the impressive Kaloko fishpond. Less than 20 miles south of Kona is impressive Pu'uhonua o Honaunau. 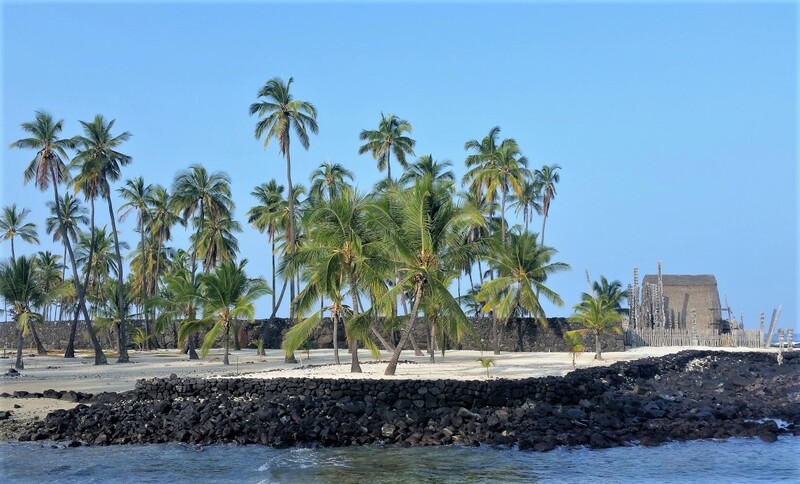 This historically significant "place of refuge" on Honaunau Bay is remarkably well preserved, offering visitors a look into an ancient Hawaiian sanctuary that once offered asylum to commoners who were in violation of kapu (laws/rules/prohibitions). 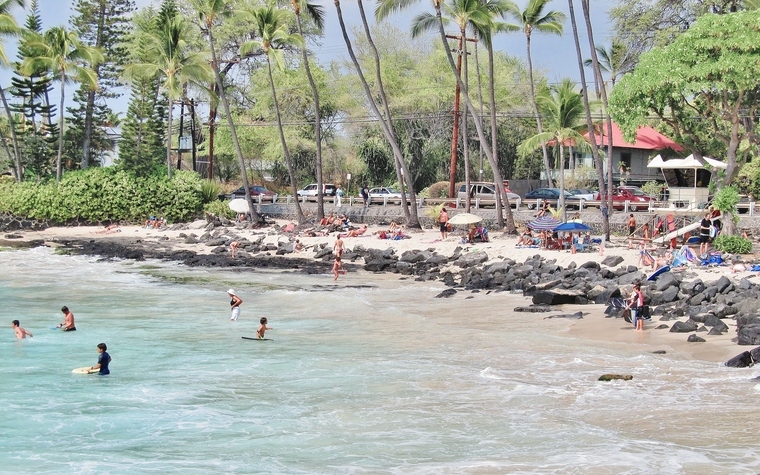 There's a great selection of wonderful Big Island beaches within walking distance of downtown Kailua-Kona. 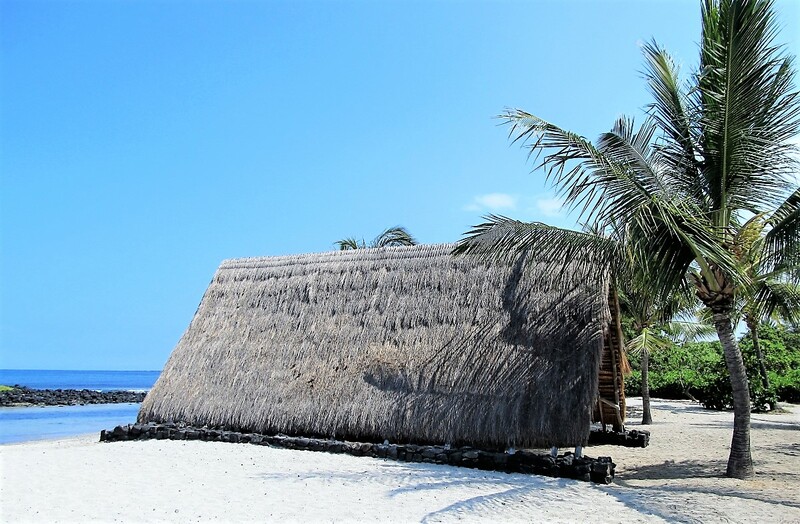 Kona beaches to enjoy include Old Kona Airport Beach Park, Honl's Beach, Pahoehoe Beach Park and Magic Sands/Disappearing Sands Beach. Protected by a natural reef barrier, the ocean in Kailua Bay is a great place to swim. With a small soft sand beach just off the pier, it's most calm early in the day. Mornings also provide the best opportunity for spotting and perhaps even swimming with dolphin. There are plenty of great snorkeling spots in town and within a short drive of Kona. We recommend bringing a mask and snorkel along wherever you go - you never know what you might find! 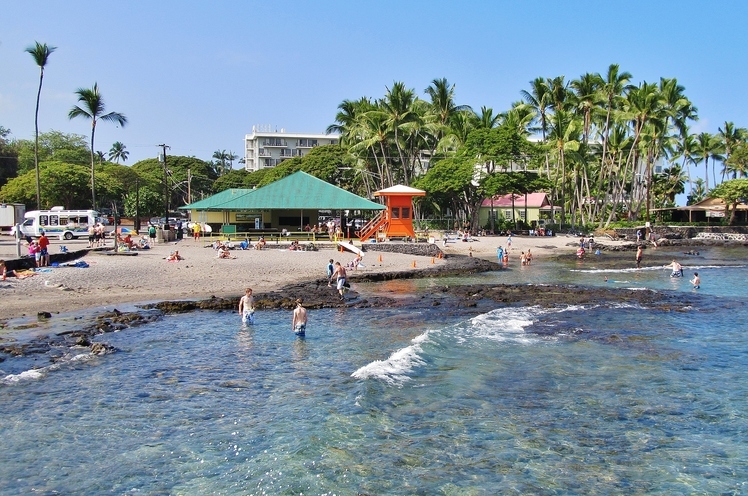 Less than five miles south of downtown Kona on Ali'i Drive, Kahalu'u Beach Park has wonderful snorkeling, good swimming, and sometimes even decent surfing. This is a great place to bring the whole family. Did you know the sport of body boarding, or "boogie" boarding, got it's start in Kailua-Kona in 1971? It all began down Ali'i Drive at Honl's Beach on Wai'aha Bay, with a little passion and a lot of ingenuity. Did you know the origins of the increasingly popular sport of stand up paddleboarding can be traced right back here to Hawaii? The Big Island has many quiet bays that are perfect for beginners, and nice waves for more advanced paddlers. The Atlantis Submarine tour is the closest thing to Kona scuba diving without actually having to get wet! Enjoy a 30 minute submarine tour of the brilliant and colorful undersea world in the coastal waters off of Kailua-Kona. 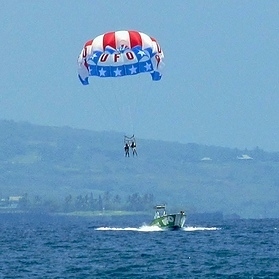 Big Island parasailing is a real thrill and a great way to see the sights along the Kona coast. Soaring high above the coast of the Big Island while attached to a parachute over the ocean is one of many fun things to do in Kona. Avid fishermen and women come from all over the world to sink a line into the rich waters off of Kona. One of the highlights for many people vacationing on the Big Island is the Manta Ray night snorkel. The Kona coast is considered the best place in Hawaii to view these amazing creatures which are among the largest fish in the ocean. Who doesn't love to eat! When you're hungry, there are seemingly countless great Kona restaurants and bars to choose from. Check out Daylight Mind Coffee Company. Located right on the water with 2 levels of seating, the location alone is worth a visit. Great coffee, great eats, great views...what more can you ask for? This is a perfect place to spend part of your day. On Ali'i Drive across from Kona Farmers Market. Some of the best coffee in the world is grown in the rich organic soil along the Kona coast on the slopes of Hualalai. Learn all about the process of growing Kona coffee, and what contributes to its premium flavor. The Hawaiian luau can be great fun for the entire family. The King Kamehameha Kona Beach Hotel, Royal Kona Resort, and Sheraton Keauhou Bay Resort are three hotels in Kona offering this colorful entertainment and sumptuous feast each week. Looking for fun things to do on other parts of the Big Island? Check out these exciting activities.